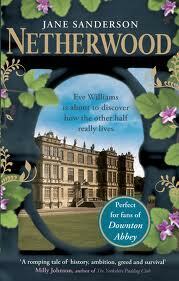 Billed as being "perfect for fans of Downton Abbey," the novel Netherwood by Jane Sanderson looks at the lives of those who live in manor houses, and those whose job it is to take care of them. In the little village of Netherwood, nearly all of the inhabitants are connected in one way or another to the Hoyland family, owners of the three coal mines in the area as well as nearly everything else. The father of the family, Teddy Hoyland, takes a nominal interest in the welfare of his workers, but he certainly doesn't go as far as encouraging a union. He employees the taciturn and devious Absalom Blandford to see to things concerning the estate, so that he isn't bothered by day to day problems. His wife Clarissa, still a beauty, is given only to thoughts of parties and social gatherings. Daughter Henrietta is "the son he never had" -- intelligent, independent, and above all interested in the goings on of the earl's various businesses. Unfortunately, in the year of 1903, when the events of the book take place, the first born son inherited everything, and there was no way to change that. Which is a pity, because son Tobias is plainly NOT interested in anything boring, which involves anything to do with business on the estate. His main concerns are drinking and women. He is handsome and charming, so most people in the village accept his good humor and ready smile as proof that he's a good boy, really. On the other end of the social spectrum are Eve and Arthur Williams. They married when Eve was young and are raising 3 children on his wages as a miner. That means that there is very little left over for luxuries, but Eve is thankful for what little they have after she visits the neighboring village of Grangely, where families are being evicted from company-owned lodgings after a prolonged strike. Eve is greatly disturbed by what she witnesses there, and when pressed by her pastor to take in a refugee from Grangely, she's reluctant to do so, but guiltily agrees. The new lodgers, Anna Rabinovich and her baby daughter Maya, soon become indispensable to the family, especially after tragedy strikes and Eve must adjust to a new situation in life. As mining is no longer an option for the family's sustenance, Eve must find a new way to support the family. At Anna's urging, she starts making cakes and pies and selling them out of the front of her cottage while Anna looks after the majority of the childcare and housework. Before long, news of Eve's success reach the ears of even the earl, and he decides to help the young woman with her business pursuits. As her business becomes more lucrative, she comes to the attention of more exalted members of society. Before long, she is sent on an extended stay to London in order to cater some large social gatherings. There her talents are again requested for all sorts of royal and high society engagements. During her time in London, she's missing her children terribly and can't wait to get back to her old life. However, she meets someone in London that makes her re-think her entire future. I was interested to see where the book would end, and what decisions Eve would make, so it was good news to reach the end and discover that there's going to be a follow-up book to Netherwood which will hopefully answer all the questions the readers might have after finishing this book. There are also some yummy recipes at the back of the book as well as Reading Group Discussion Points, a Q&A with the author and (best of all) the first chapter of the next book in the series, Ravenscliffe. I'm really looking forward to reading the follow-up to find out what happens to all these characters! You really do feel as if they're your friends by the time you get to the end, and it's a shame to leave them!